New Region To Be Created From Northen Region? Damongo (N/R), April 22, GNA - The Government is in consultation with the Electoral Commission (E/C) on the feasibility of creating a new region from the Northern Region, Vice President Aliu Mahama, told the chiefs and people of Gonjaland, on Wednesday. He has, therefore, urged the people to exercise restraint for the due process to be followed and conduct their daily activities on normal basis. Vice President Mahama was responding to an appeal by the Yagbonwura, Bawah Doshie Abudu, King of Gonjaland, to the government to expedite action on their request for the creation of a new region, when he addressed a durbar held at Damongo in his honour. Almost all the Chiefs in Gonjaland, where the Vice President visited, as part of outreach programme to elicit views for good governance, made the same request. The Yagbonwura had explained that in view of the vastness of the Northern Region, the new region would ensure effective administration and facilitate development. All ethnic groups would be welcomed in the new region and have equal access to its resources and land, he said. Vice President Mahama pledged that the Government would not relent in its efforts to implement development projects that would improve the quality of their lives and reduce poverty. He announced that the Government had allocated 16 billion cedis for the upgrading of Damongo Secondary School to a first class second cycle institution. Accommodation for teachers and students, a computer centre and other facilities that would enhance teaching and learning would be provided. Vice President Mahama said the Government would this year spend 500 million cedis to construct an additional ward at the Damongo Hospital. The Government, Vice President Mahama said was also sourcing funds from the African Development Bank to tar the Fufulso - Damongo - Salwa road, which is being rehabilitated to facilitate the transportation of agricultural produce to boost socio-economic activities. On the request of the people for the provision of additional potable water sources to meet the needs of a growing population, Vice President Mahama announced that the Community Water and Sanitation Agency would be assisted to provide them with boreholes, adding that negotiation were ongoing to secure funds from the World Bank to build a dam as a long-term solution. He appealed to the people to maintain the peace in their areas and prioritise the provision of quality education for their children. Yagbonwura Abudu commended the Government for the creation of two new districts for Gonjaland and the provision of basic infrastructure like schools, clinics and roads. He urged the Government to support the resettlement of about 100 families, who were rendered homeless in a recent rainstorm. 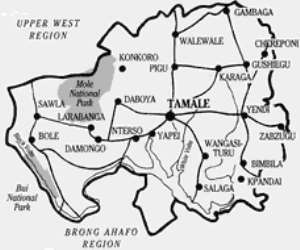 The King of Gonja appealed to the Government to ensure that part of the proceeds from the Mole Game Reserve was paid to the Traditional Council because the people had been deprived of the resources from the forest as a result of the creation of the reserve. He complained about the killing of poachers by Game Wardens instead of arresting and handing them over to the Police and called on the Government to intervene stop the practice. The Vice President earlier visited and interacted with the chiefs and people of Busulu, Buipe, Yapei, Kusawagu. At all the places the people commended the Government for the projects so far provided in their communities and asked for more utilities such as electricity, telephone facilities and potable water. At Yapei, the Vice President inaugurated a 180 million-cedi classroom block for the local Presbyterian Junior Secondary School and announced that the Government had spent about 20 billion cedis to pay for the examination fees of the Basic Education Certificate Examination (BECE) candidates, while eight billion cedis had been allotted to subside basic education in 40 deprived communities. He inspected a newly constructed clinic at Buipe built at a cost of 160 million cedis. Work is steadily progressing on another block at the cost of 225 million cedis. The Minister of Education Youth and Sport, Kwadwo Baah-Wiredu; Minister of Health, Dr Kwaku Afriyie; Alhaji Mustapha Idriss, Minister of Works and Housing and Mr Ernest A. Debrah, Northern Regional Minister are accompanying Vice President Mahama. The others are Mr Boniface Abubakari Saddique, Deputy Minister of Tourism and Modernisation of the Capital City; Hajia Alima Mahama, Deputy Minister of Trade, Industry and President's Special Initiative and Mr Alex Sofo Deputy Minister of Roads and Transport.